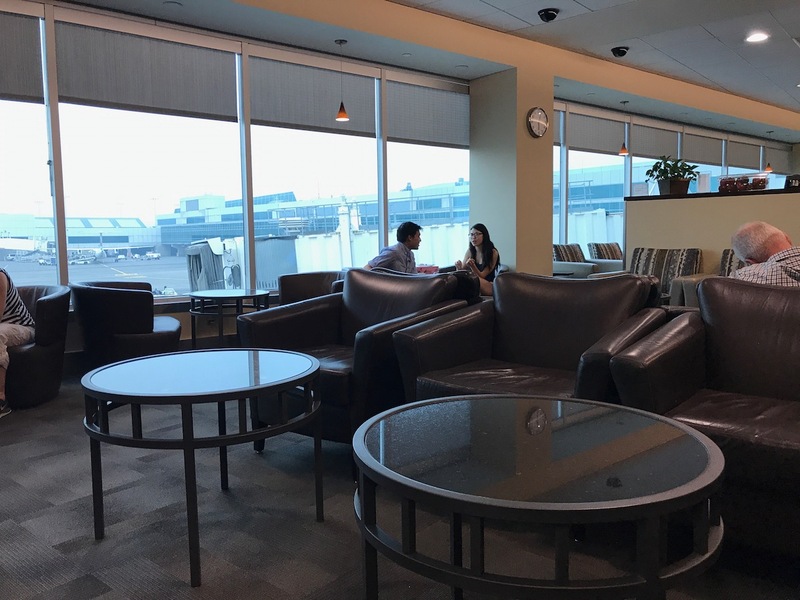 Now that I’ve reviewed the three non-conventional Priority Pass “locations” at Portland Airport — House Spirits Distillery, Capers Cafe, and Capers Market — it’s time to review the one “traditional” Priority Pass lounge at the airport, that has been around for a long time. I’m talking about the Alaska Lounge. 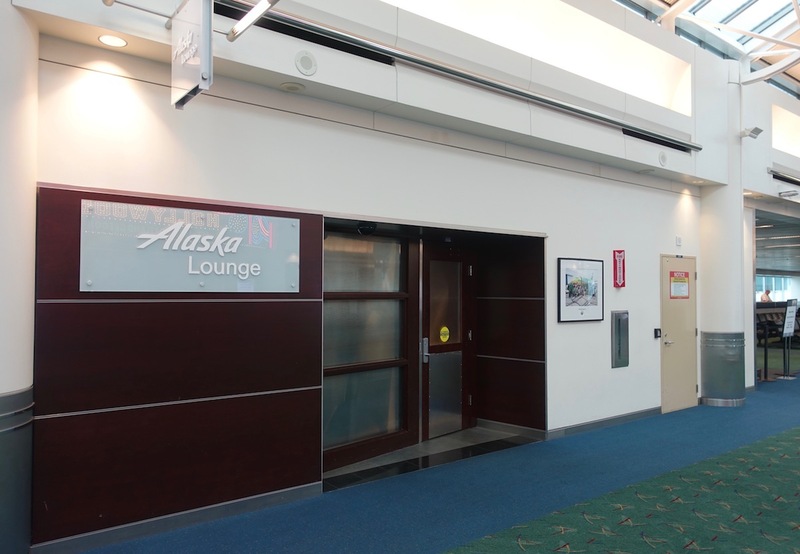 The Alaska Lounge PDX is located near gate C5, which is a short walk from the security checkpoint, and accessible airside from all gates, and especially close to House Spirits Distillery and Capers Cafe. The Alaska Lounge is open daily from 5AM until 11PM. We visited on a Wednesday afternoon, when the lounge was fairly empty, which seems rare, given how small the lounge. Do note that this lounge often has capacity restraints for Priority Pass members due to crowding. Expect that to be most common in the mornings and on peak travel days, like Mondays, Thursday, and Fridays. 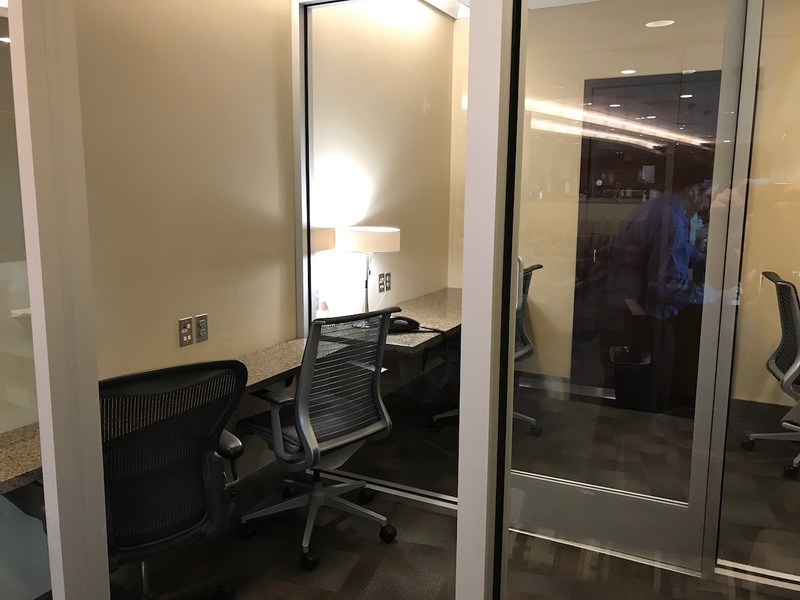 On the plus side, I could have otherwise gotten into the lounge using my American Admirals Club membership, which I have through the Citi® / AAdvantage® Executive World Elite™ Mastercard®. 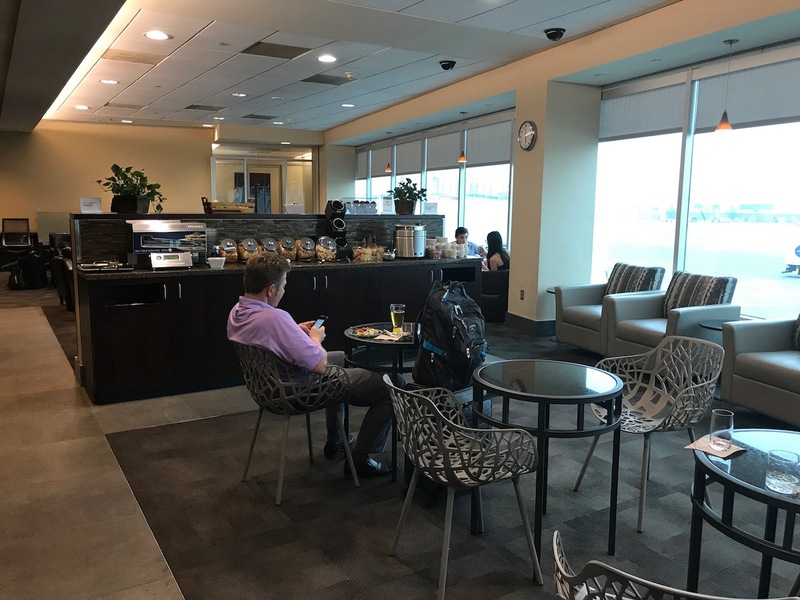 This was my first time in the lounge, and it was smaller than I was expecting for Alaska’s lounge at their hub airport. Inside the lounge and to the right was a small TV area, with a bunch of chairs pushed close together. Then the picture below shows the entire rest of the lounge. Just past the TV area is the cafe area, which has some small dining tables, as well as some leather chairs along the windows. Past that is another small seating area with maybe a dozen leather chairs. Past that is the business center, with about a dozen cubicles. 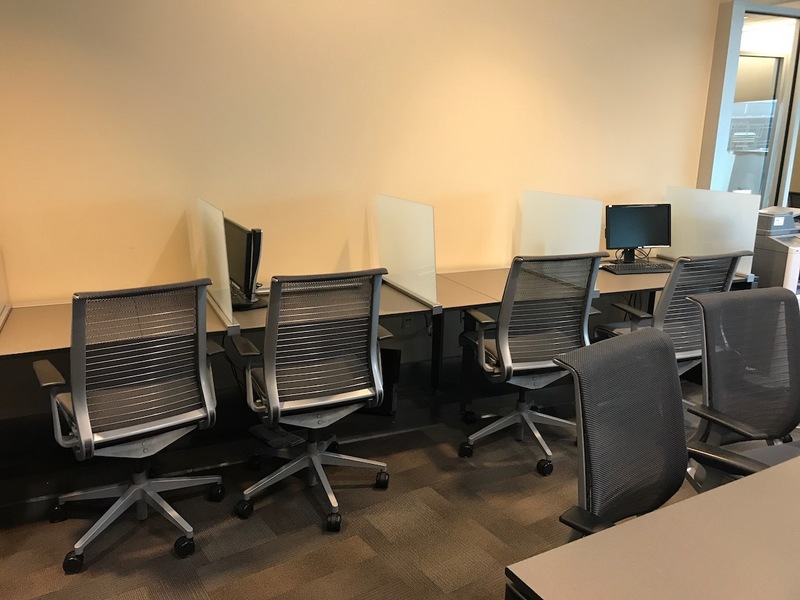 In the back corner are some more rolling chairs, including a small separate room, which is presumably intended to be a quiet area, or something. 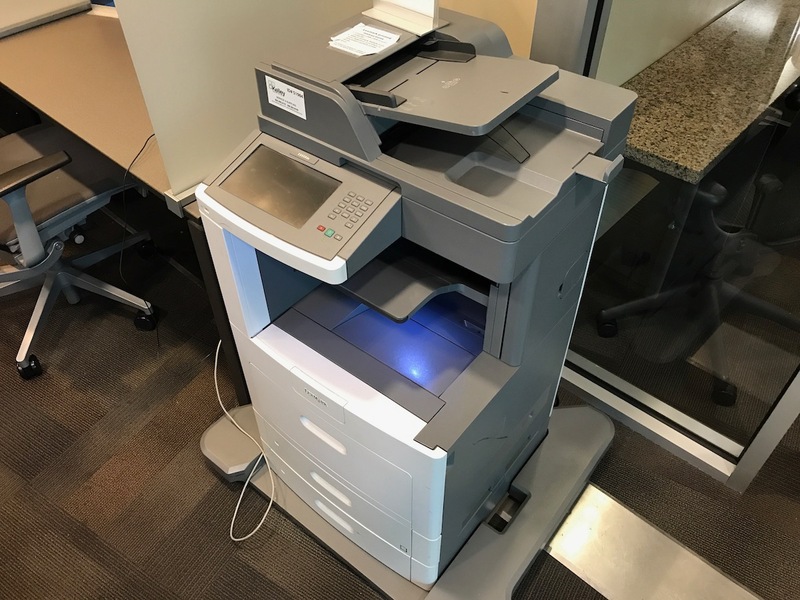 There’s also an industrial printer in this area. The lounge has decent views of the tarmac. 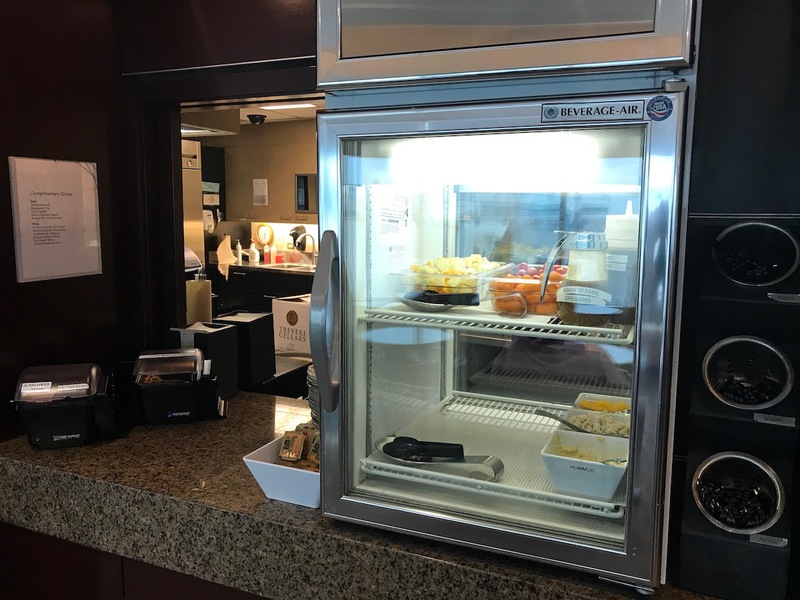 The food and drink selection was pretty typical for an Alaska Lounge. 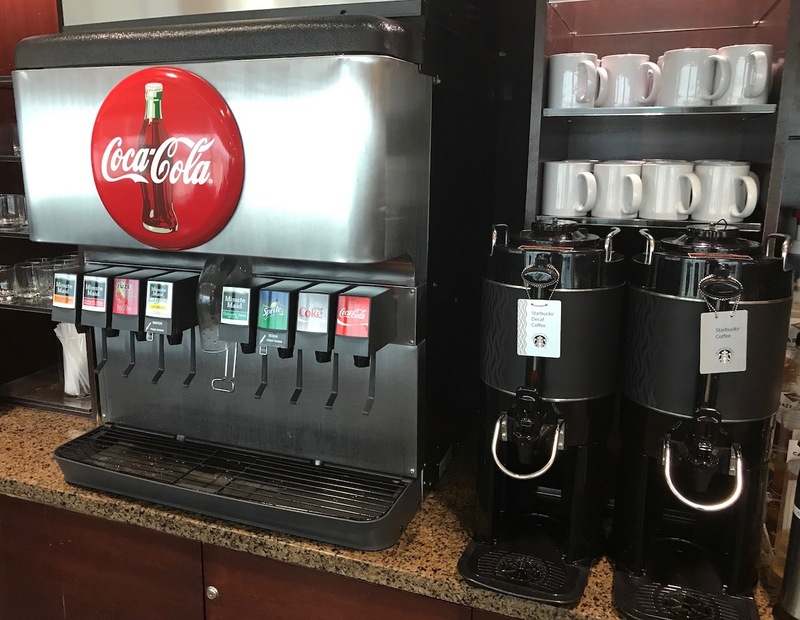 Along the interior wall was a Coca-Cola soda fountain a Starbucks coffee machine (which is one of my favorite lounge coffee machines), and a couple of canisters with filtered coffee. 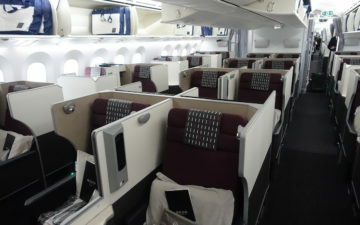 There was also a window where alcoholic drinks are available, which are served by the lounge attendants. Choices include house beer and wine, though the lounge has no liquor. 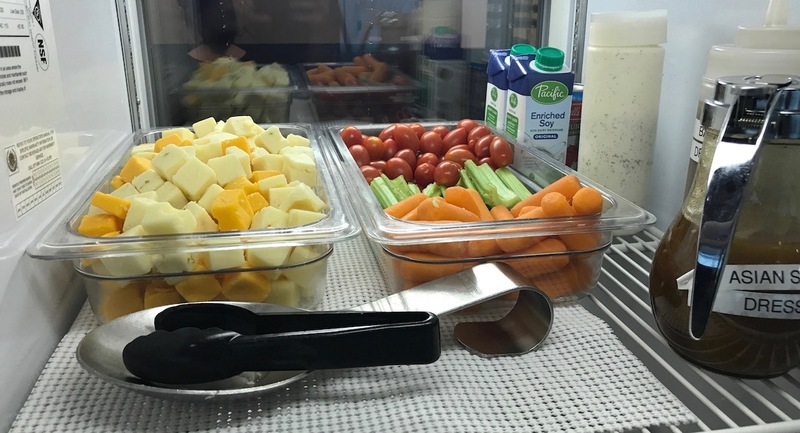 Next to that was a fridge with some cubed cheese, veggies, salad, hummus, and chicken. 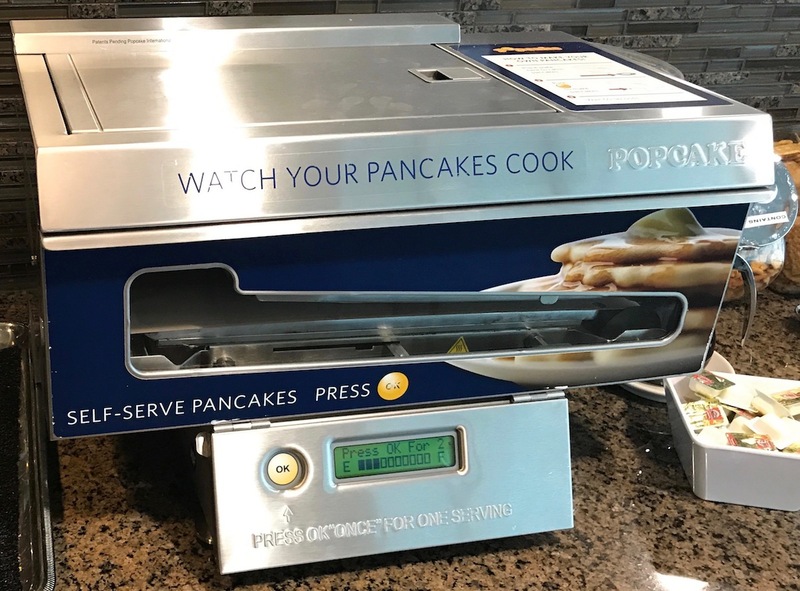 Then separating two of the areas of the lounge was a counter with the pancake machine (which wasn’t available at the time — they only turn it on in the mornings), as well as pretzels, cookies, snack mix, etc. 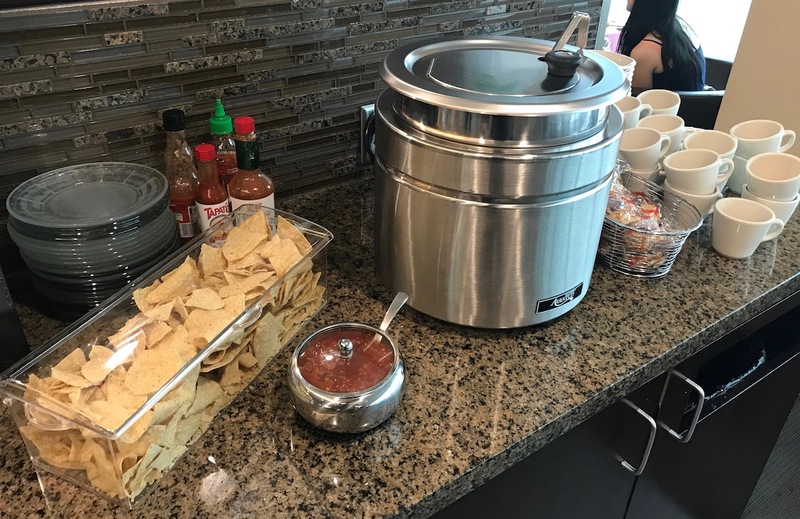 Lastly there was soup, along with chips and salsa. The bathroom was in the far back corner of the lounge. 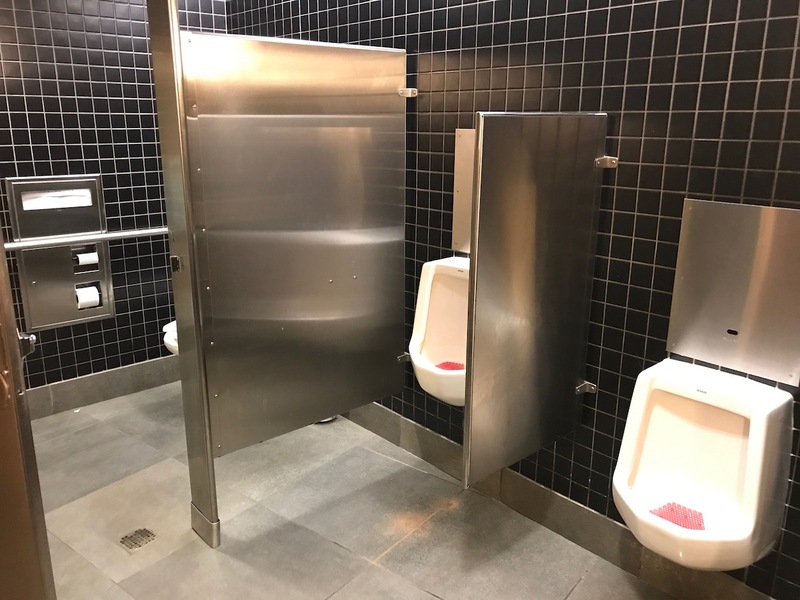 The mens room had just one stall, which doesn’t really seem sufficient given the size of the lounge. For what it’s worth, the posted maximum occupancy of the lounge is 95 people. 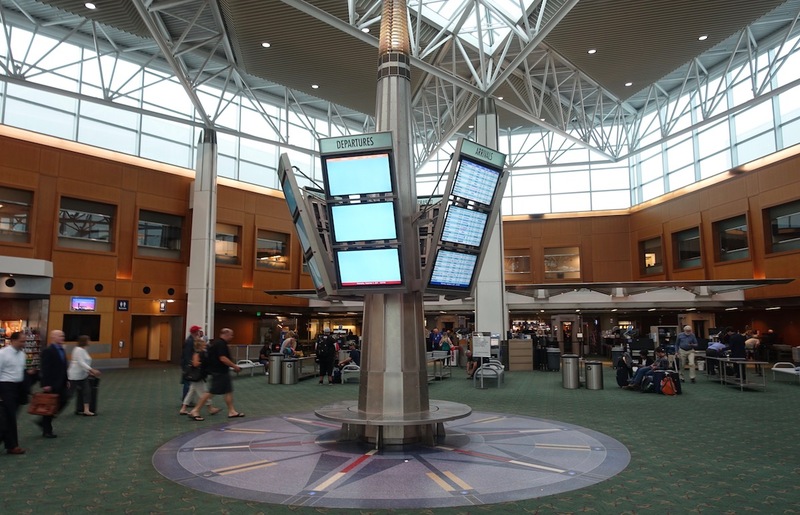 Portland Airport is one of the best airports in the US, and it has a ton of restaurants and other cool concepts, like a distillery, movie theater, and nice-looking spa. Given that this is Alaska’s hub, I found the lounge underwhelming, in terms of the size, decor, etc. I’ll take it a step further — for most people I don’t think this lounge is worth visiting. It was pretty empty when I visited, but I’ve heard otherwise it gets really crowded. Frankly I found the gate area to be more modern and spacious, and it also had outlets everywhere, with free wifi. 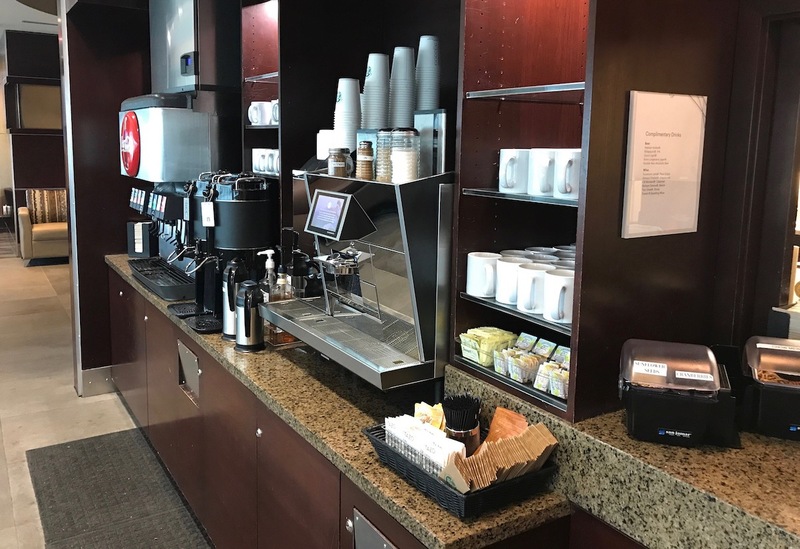 So I’d rather have a snack or meal (or even just grab a cup of coffee) at Capers, and then sit somewhere else, because this lounge isn’t great. Let’s just face it. 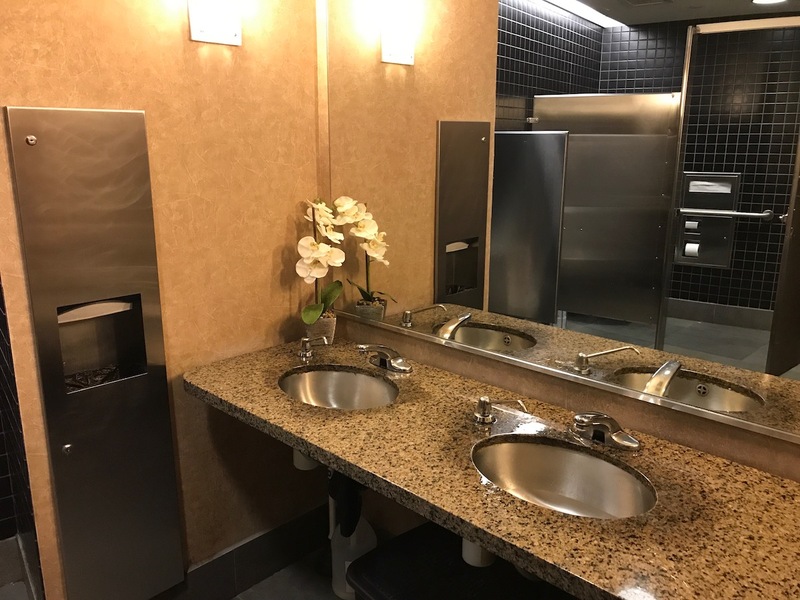 This is one crappy lounge. Agreed. In a 4 horse lounge race at PDX, this one sadly finishes out of the money. PDX is Alaska’s hub?? I always assumed (wrongly) that SeaTac was their hub. I have an AL Membership, but not for this lounge. As a PDX-based flyer, this one is indeed dismal. 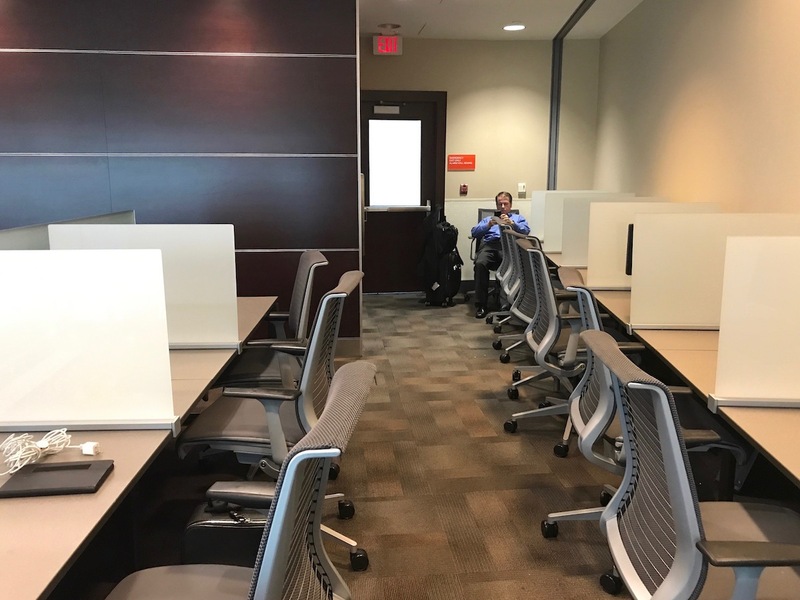 And I can attest to the crowding, mostly from 5am-11am and there have been more than a few times where literally every seat or chair was taken – SRO. Have written to Alaska, and they are working with the PoP to find larger space, though it’s becoming a premium in PDX. I use my membership mostly for the LA T6 location and the SEA locations. If it weren’t for those, I would dump my membership and rely solely on PP. The new restaurant options and distillery are really nice adds, and am hoping PP adds even more of the better places to eat at the airport. PDX isn’t a primary hub for Alaska. Their lounges at SEA and ANC are much nicer. IIRC this lounge does not serve spirits, they only serve beer and wine. I tried to get a bloody mary, they couldn’t do it and instead offered me a mimosa. @ thomas — You’re absolutely right, I stand corrected. Updating the post now. PDX is one of their secondary hubs. Main hub is SEA but PDX is also a hub for flights to/from Alaska, Hawaii, CA and east coast. Only been to the AS lounge in LAX but I sure do love those pancakes. Lukcy, you forget the merits of the pancake machine!! That alone is worth a PDX Alaska Lounge visit! You nailed the review. While the pancake machine is indeed a morning high-point, Capers is a much better place to while away an hour before the flight than the dumpy Alaska lounge. Bryan T: Yes, the beer is a local handcrafted variety, differing with the seasons. At least they give you that much…. I’ve been an Alaska MVP gold and lounge member for 10+ years and I have complained about pdx lounge since day one. It’s embarrassing. I think you were too kind. Alaska is a great airline with exceptional service, that just doesn’t get “premium,” on the ground or in the air. Their exceptoinal staff struggles with a bad product up front, which is ironic b/c their coach product is p rhaps the best I US. 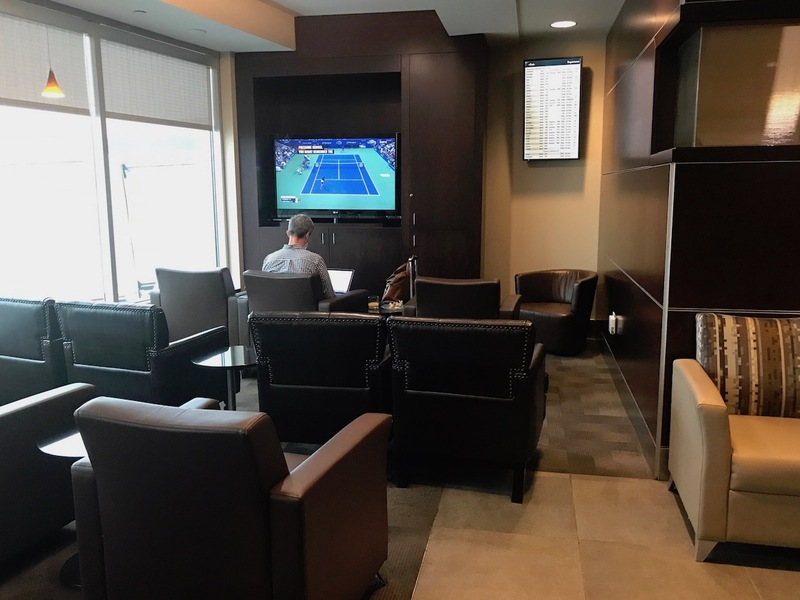 The PDX lounge is admittedly the most extreme example of this phenom, but it’s a great example that a VIP lounge in the middle of a great airport isn’t even worth visiting… next time stop in the free mini movie theater just across the way…it’s great! “Alaska’s hub”? I think Seattle would beg to differ. @Dennis — exceptional staff is right. I was a PDX based MVP Gold for many years and while the physical lounge lacks a great deal, the staff are over the top friendly and helpful. It’s been nine years since I left Portland and all the staff who were there when I was still recognize me. A couple still address me by name when I walk in. Try that in ANY Admiral’s Club or even most of the other Board Rooms. Love the PDX Boardroom team! Not surprising–poor us airlines. They cannot do anything right but hustle. That lounge was depressing; look at the sad people diddling with phones and looking shallow and empty. It IS indeed the us! 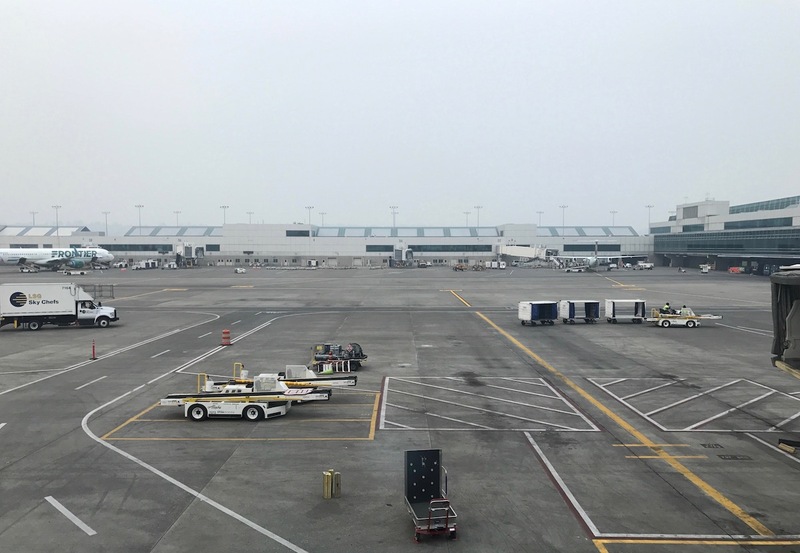 PDX just kicked off a big new construction project to extend the E concourse and when that’s done Alaska will move their operations there so we can assume that it’s going to include a new Alaska lounge. But it’s still going to be a few more years before that opens.